Hello everyone! With you Obustroeno and Catherine Finally, came the turn of the luminous part of our orchids Due to what it will glow? Due to such LEDs with a diameter of 2-3 mm.. There are large LEDs, but for us they do not fit So, we will need: 1) small LEDs, glow white; 2) connectors for LEDs; 3) 15 Ohm resistor; 4) wire 1.2 mm; 5) heat shrink tubing; 6) soldering iron and tin; 7) hot adhesive LEDs need to be inserted here in this connector. The width fits under the LED. I have 2 wiring: red and white I will do a white wire +. You can do as you like. The main thing then do not forget where +, and where -. The wire that will be on the topmost flower should be as long as possible. So that at the end of the branch you can connect all the wires. We need a 15 Ohm resistor We will need to solder it Cut wire +. Now you need to solder the resistor between the two ends. Heat soldering iron Process the edges of the resistor, which will solder. And the edges of the wire. Connect the edges. Take a drop of tin. Do not take too much And solder. The connection point must be completely closed It can be done quickly using a heat shrink tube. Cut off a piece Appropriate length. Heat with a lighter so that the heat-shrinkable tube tightens the cable. Here is the wire + This will be the stem of our flower, so we completely close it with a tape. And after that, you will not be able to see where +, and where -. So take the nail polish or white marker, and mark the side with +. Thus we prepare as many blanks as we will have glowing flowers Take the wire at least 1.2 mm. And paste between the two wires of the connector. This will give the branch stiffness. 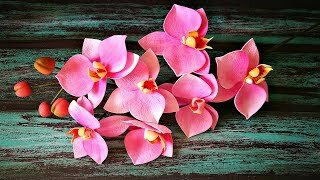 Now paste the petals You can glue them with hot glue or Kosmofen. Apply the glue on the middle element. Glued as close as possible. The double lobe will have to be cut. The second petal we glue on the same principle. Wrap the whole stem with a tape together with wires. Screw the tape to the very top. Now you can collect. At first buds. Buds can immediately be corrected, giving them the right shape. Fix the first flower Do this with a tape Turn around the one that is on the longest stem. By the same principle we collect the remaining flowers. Now you need to insert the LED That antenna, which is longer on the LED, is +,. The one that is shorter - When you shorten them, leave + longer. Insert Here is our LED Tone a branch in brown (you can take a dry pastel). If desired, cover with acrylic varnish.